AGE OF DINOSAURS deals with a group of badly animated dinos rampaging through greater LA after escaping from a biotech facility. A bloated Treat Williams headlines as a firefighter who get trapped in chaos and spends the rest of the running time keeping his daughter (Jillian Rose Reed) out of harm's way. 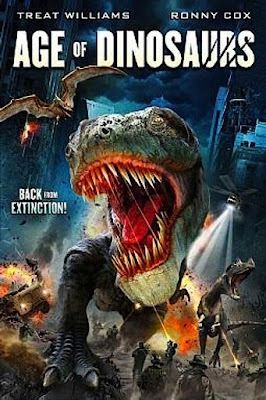 This dino sized mess is available from streaming on Netflix, VUDU, and Amazon Instant Video, but as always, you're better off leaving the raptor turd whispering to us and go find something more interesting in the Creationist Museum.